America is facing a major battle, a war actually. Heart disease is always a crucial concern, the onset of adult diabetes is on the rise, and many have been left scratching their heads, looking aimlessly for what’s causing all the healthcare woes. The cold hard facts are written on the wall. Obesity is a major problem that’s getting worse and there are very few effective countermeasures in place. Why are people eating so much junk food? Why is it that what society dictates as suitable eating alternatives, leave so many people craving high fat, high carb, inexpensive and highly processed foods? The dichotomy between cheap and processed is hardly novel any more. There’s a whole segment of the market devoured to putting out the lowest quality, packaged junk you can imagine. For far too long, diet gurus have underestimated the discipline of people looking to lose weight, chalking their inability to stay on diets, to their lack of will power and lack of commitment. But have they ever asked themselves if their clients are hungry? Diets fail because, typically, they’re fads and short-lived – they lack consistency. A sensible way of eating is the way to go, but it should be permanent. 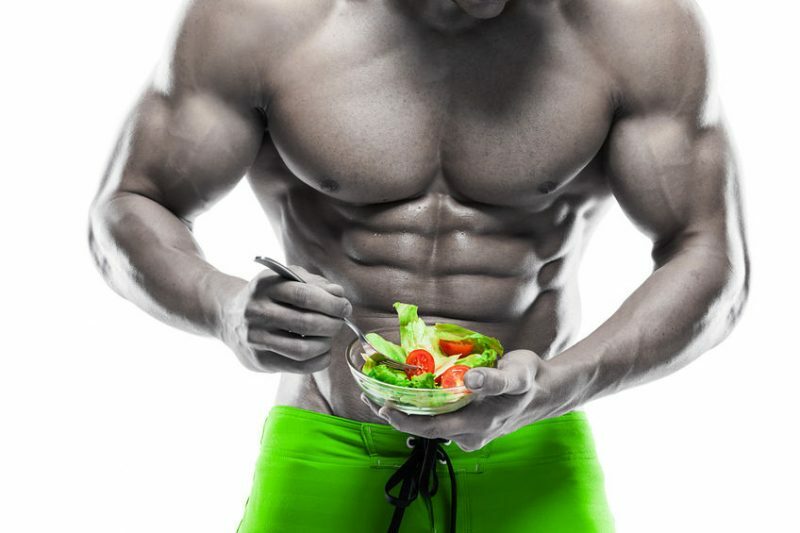 In this article I’d like to talk about salads (the chief filler in most Americans’ idea of healthy eating), also touch upon other health foods, and speak to our need for protein, particularly for those engaged in physique and strength-based sports. What are salads, exactly? Usually, they consist of a few staples. The first being iceberg lettuce. Iceberg lettuce is crap. It has practically no nutritional value, but it’s cheap and helps to full up a plate. Next there’s tomatoes. Tomatoes are actually a fruit, they have some carbs, but a few slices won’t impact you – get it? Impact Carbs? LOL (Nevermind). Now, if you’re not dieting and you don’t care about calories, then your “salad” consists of just lettuce and tomato and a bunch of high-fat, high-carb dressing. For those dieting, a few others ingredients can come into the mix, like red onions, some carrots, maybe even some broccoli. Basically, though, salads consist of ruffage and whether you use diet-friendly dressing or not, you’re not getting any real protein. Some may put some shredded cheese, but in all honesty, that cheese won’t amount for more than 3-5 grams of protein. And since we’re writing this article with diet in mind, most diet-friendly dressings won’t have much fat, but even those that do, none will have protein. Vegetables and fruits also, only have trace amounts of the muscle-building macro, so be mindful of that when using it to suppress hunger. There’s entire chains devoted to selling salads, some add meat, some add cheese, some even add plant-based protein, but the veggies take up so much room, that again, what you’re getting in terms of protein is minimal. Protein is key to repairing and building muscle; therefore, this meal selection is a poor choice for most athletes. In fact, most “healthy” foods are based on the low fat model. Take eggs, for example. Eggs are protein-packed; they also have excellent healthy fats in the yoke. Nonetheless, those who see fat as the enemy, will toss the yokes instinctively. There is a very real lack of education in our fine country. Very few people know the difference between saturated and unsaturated fat. Even fewer know what good fats are and even less know which fats are essential. The witch hunt on fat has hit its peak. Sugar is starting to get some blow-back and companies are reducing sugar content, however, sugar won’t be going anywhere. Carbs, alone, won’t keep people satiated, but people are willing to deal with the insulin spikes or the fat gain, so they won’t be hungry. Hunger is simply unacceptable. The only macros that give people that full stomach feeling are fats and protein. By process of elimination, the smart money would be on high carb, high protein, but protein is expensive, as are healthy fats. Most junk food goes for heavily processed, high sugar, and bad-fat junk food (e.g. trans fats). These items are cheap, easy to produce, and sell like hotcakes – literally! Healthy foods, on the other hand, lack the complex (good) carbs and often times, also the lack (good) fats. Worse yet, they also lack the protein!! Many of the foods dieters subsist on, are largely empty calories, like iceberg lettuce, forcing them to go around hungry all the time. Hunger is the culprit in most diets failing. Only protein and fat will ever make you feel full. Simple carbs will hold you over for 20 minutes. Complex carbs might hold you over all day, but you won’t build a smidgen of muscle with them and you also won’t repair the muscle. I like the idea of fiber and eating plenty fresh fruits and vegetables, but these foods should never be the bulk of your daily caloric intake. I have no medical or dietary education and I’m only speaking for myself, but a bowl full of iceberg lettuce with a fat-free dressing and a few tomato slices, is not going to do much for me. Starvation should not be the way anyone loses weight. When you starve, you’re losing muscle, losing strength, and more than likely compromising your health (e.g. doing yourself metabolic damage). I believe in sensible eating – according to your needs. If you have an office job and lead a large sedentary lifestyle, then 2,000 calories may be plenty. The same way we scoff at contest prep gurus who recycle diets, I think the same applies for these models that everyone is supposed to live by. Any product that bases calories on a 2,000 calorie diet, is basically pushing that preset number across the boards. A tall man, working construction, who also bodybuilds should not have the same caloric intake as a software programmer whose cardio consists of walking to and from the car to his cubicle. It’s also not realistic that a man and a woman should consume the same amount of calories, especially given the physiological and hormonal differences. Again, what seems pretty obvious, often times gets lost in translation. What’s your take on salads and other low-protein “healthy foods?” Would you eat them? Do they represent the best approach to combating obesity? I hope you enjoyed reading this article at IronMagazine.com. Please leave your comments here or wherever you may seen this article. Previous Previous post: Do We Rely Too Heavily on Supplements? Next Next post: Who Cares About Legs?